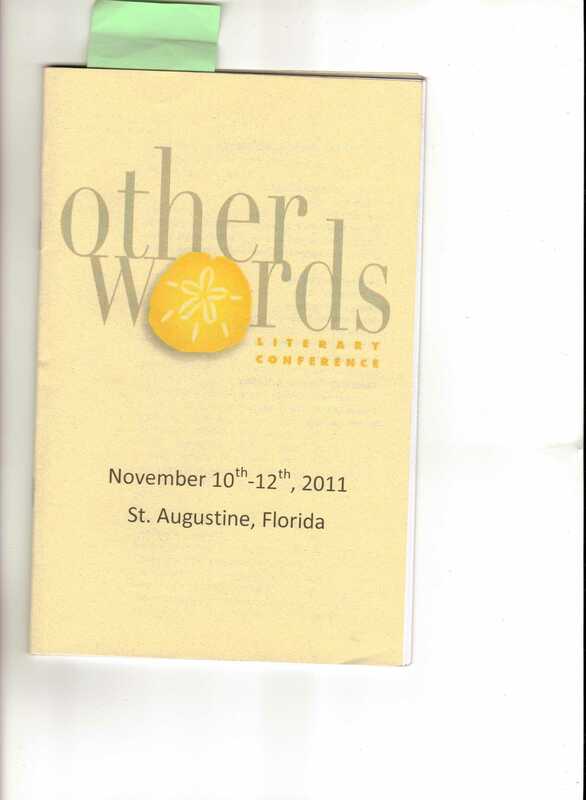 I started off with the “Other Words” Conference in St. Augustine, where I sat on a panel that paid tribute to the late great Jeanne Leiby.While my panel discussion centered upon Jeanne’s “courage and talent” mandate in her old fiction workshops, you can also check out the tribute I wrote over at the Burrow Press blog. If you’ve never met Jeanne, this should give you a good idea of her life as a writer, editor, teacher, and mentor…and if you did have the pleasure of meeting her, I invite you to leave comments on that blog posting. Here’s my disclaimer: I didn’t know I was reading at the event. I hadn’t planned on it. But, as judge (and former Orlando Magic player) Adonal Foyle said of my performance, I stepped in “like JJ Reddick, coming off the bench to nail a three-pointer,” when one of the performers did not show. I found a story that I’d published at an online literary journal, and read from the screen of my cell phone. Check out the photos. I need a haircut. I’m wearing a shirt that’s probably a decade old, and jeans scooped from the floor of my bedroom. I had a beer beforehand, while I was watching the first half of the Bears game and waiting for the venue to open up. Now…check out the photos of the other well-groomed contestants. Ask yourself: which one of these does not belong? Ahh, Literary Death Match. Thank you for having me. Hopefully I didn’t embarrass myself too much. This entry was posted in Orlando Literary Scene. Bookmark the permalink.